That was a fantastic finale! 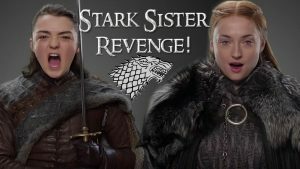 The Stark Sisters united against Little Finger! That made me very happy! We got to see so many characters in one place at the Dragon Pit! You can call it fan service if you want but I loved it! 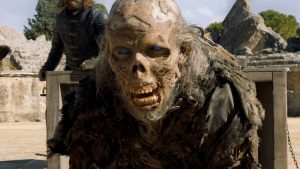 The closing shots at Eastwatch were absolutely terrifying! It’s everything we wanted! Though some of my friends are really grossed out about Jon getting it on with his aunt. I say you just have to have an open mind. There were so many great moments in this scene I was jumping out of my seat! Bronn and Tyrion poking fun at each other. Podrick telling Tyrion “I’m happy you’re alive”. Brienne and The Hound. Awkward. But they made up. Brienne tells him that Arya is alive and well and home at Winterfell. I can’t wait for that reunion! The look that Cersei throws at Tyrion! Damn! She hates him! Euron giving Theon the eye. Brienne swooning over Jamie and Cersei not liking it one bit. We didn’t get to see ‘Clegane Bowl’ but after that confrontation I am sure we will before the last season is over. Everyone was there except Daenerys. Of course, she was fashionably late and she made one hell of an entrance. She rode in on Drogon! Cersei acted unimpressed. “We’ve been here for some time” She tells Dany. Finally, The Hound opens up the crate and the capture wight heads straight for Cersei! Nobody likes her! The wight was on a chain however so Cersei was safe but she looked rattled. The Hound slices the wight in half and both halves kept moving. He sliced off a hand and the fingers kept moving. Qyburn was impressed! Jon then demonstrated that you can kill them with fire or you can kill them with dragon glass. They need a truce so they can fight the war with the dead first. Jamie asks how many are there and Dany told him she saw one hundred thousand. Euron asks if the dead can swim and Jon says ‘no’. He says he’s going back to Pike then and urges Dany to go back to her island as well. Then he high tails it out of there. 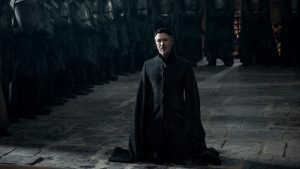 Cersei says she will agree to a truce but asks that once the dead are’ dead’ the King of the North stay in the North and not attack King’s landing. Jon being the honorable man that he is refuses to make that promise. “I cannot serve two queens.” And just like that Cersei is out of there! Everyone gets mad at Jon for not just lying to Cersei but if you know Jon you would know that he does not lie. He’s Ned Stark’s son in that regard. Dany gets upset with him but actually she liked it. Davos seemed disappointed. So Tyrion decides to go speak with Cersei and try to convince her. The scene between Cersei and Tyrion was magnificent. Lena Headey does some of her finest work in this scene. There has been a lot of complaining about how fast the season has been moving but this scene and several others in the episode make up for it. 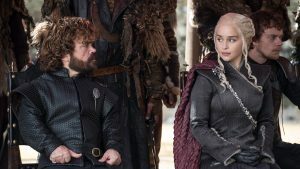 Tyrion finds out Cersei is pregnant and she not only agrees to the truce but vows that she will send her forces North to fight the dead. It seems Tyrion got played. Every one of his plans this year has gone wrong. 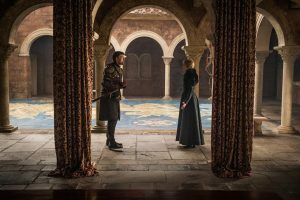 Cersei tells Jamie she has no intention of sending her armies North. 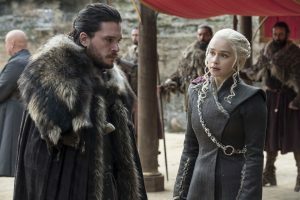 Jamie is convinced that they need to fight with Jon and Daenerys against the dead. Cersei isn’t worried. 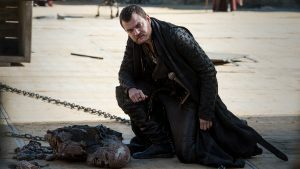 Euron only pretended to be a coward and is headed to Essos to get the mercenary company known as The Golden Company, 20,000 strong. Cersei really talks down to Jamie and makes plans with Euron without filling him in. This is the final straw for Jamie. For a second there I was sure Cersei was going to have The Mountain kill Jamie. I think she was prepared to but she just couldn’t. “No one walks away from me.” Cersei says but that is exactly what Jamie does. He rides away from King’s Landing as snow begins to fall. Theon and Jon have a heart to heart and Jon forgives him. Theon says he’s always struggled on making the right choices. He always felt he had to decide if he was a Greyjoy or a Stark. “You don’t have to choose. You are a Greyjoy. And you are a Stark.” Jon tells him. Jon gives him his leave to go after Yara. 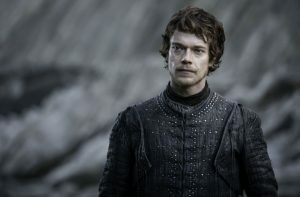 Theon has to fight one of his own men to get some cred back. He takes a pretty good beating and looked to be doing a ‘Cool hand Luke’ until the guy knees him in the groin. Theon just smiled. Nothing there! Wrong move! Theon finally gets his fight back and beats the guy down. Theon plans on trying to save Yara who is apparently still alive. But Euron is sailing to Essos so I’m not sure what Theon’s plan is going to be. Perhaps Yara is held captive in King’s Landing somewhere and they’ll bust her out. When Sansa has Arya summoned to the Great Hall I was worried. They made it look like Sansa was going to smack Arya down but thank God that wasn’t the case. SNAP! Sansa accuses him of the murder of John Aryn and Lysa Aryn and conspiring against Ned Stark. Bran chimes in with the tidbit that Little Finger held a knife to Ned’s throat and saying “I did warn you not to trust me” Little Finger ends up on his knees begging Sansa for mercy but Sansa looks over at Arya and Arya ever so calmly slicing his throat with his own dagger. No more climbing the ladder for Lord Baelish. 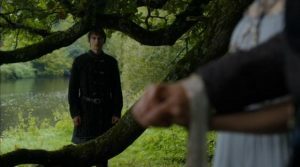 It was nice to see Bran wheel himself away from that tree for a few minutes to seem normal again and help his sisters. Sansa and Arya have a nice scene where they seem to accept each other but of course, they still have a little bite in them. Sansa is upset that Jon bent the knee to Daenerys. 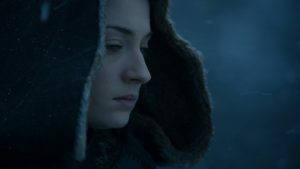 It will be interesting to see what she will do when they arrive at Winterfell. I have a feeling she will not bend the knee. The Starks have Winterfell back and soon it will be known that Jon is a Targaryen. Things are going to get complicated. Sam finally arrives at Winterfell and meets with Bran who remembers him. “You helped us get beyond the Wall. You’re a good man” Bran tells him. They share a few light moments before getting to the nitty gritty. 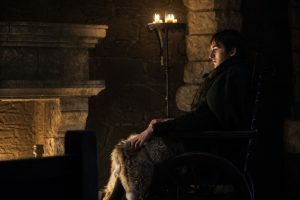 “He needs to know the truth.” Bran tells him. But Bran apparently didn’t have the info that Rhaegar had his marriage annulled and married Lyanna because he says that Jon’s last name shouldn’t be snow but ‘Sand”. “Dornish bastards are named Sand”. Sam has to inform him of the maester’s diary. So Bran doesn’t see everything? Once Sam tells him he seems to be able to see it because we get the flashback to the wedding ceremony. We also see a flashback to the Tower of Joy and learn that Jon’s real name is Aegon Targaryen. Aegon, of course was the first Targaryen king. He united the seven kingdoms, founded King’s landing and created The Iron Throne. As we are getting all this info we also see Jon and Daenerys hooking up on the ship sailing for Winterfell. It finally happened! And I just bet she’s going to get preggers! Wait until they find out they’re related! What was with Tyrion being kind of creepy in this scene? He’s in the hallway and sees Jon enter Dany’s’ room and he looks really upset. Is it because he’s jealous? Worried? I’m not sure but he sure looked creepy. The final scene was horrifying. Tormund and Berrick enjoying the view from atop of the Wall at Eastwatch when all of a sudden here come the dead. And that wasn’t all. The reborn Viserion came flying out of the night with you know who riding him. It was like the wicked witch on her broom! Only this was much scarier. Viserion may be referred to as the ‘Ice Dragon’ but he still shoots fire, albeit, blue fire. And he seemed to move a lot faster now that he’s dead. Tormund yells for everyone to run! They don’t have an elevator at Eastwatch apparently so they had to try and get down by running down the stairs. 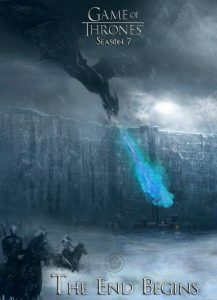 Viserion started shooting fire at the Wall and it came tumbling down! Tormund and Berrick should be dead but we didn’t see them die so they’re probably still alive. The dead are marching towards Winterfell! Is that where the big battle will be? Oh man! We may have to wait until Spring 2019 to find out! I hope its sooner! 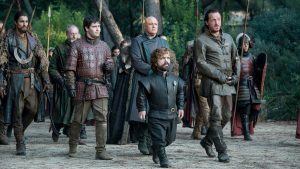 Tyrion creeping around while Jon and Dany got it on bothers me. There is a reason he’s acting weird here. Theories are forming that he cut a deal with Cersei. 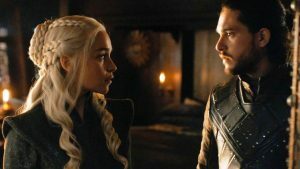 The scene between the two of them ended with Tyrion realization of Cersei’s condition and saying “You’re pregnant” then all of a sudden they come back to the Dragon Pit and she lies to Dany and Jon. Something happened that we didn’t see and it doesn’t feel good. 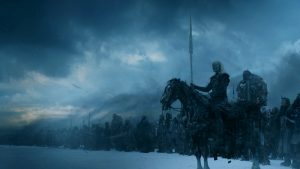 Jon and Dany will defeat the Night’s King and the army of the dead and we will lose many of our favorite characters in the battle. But The Hound will not die. 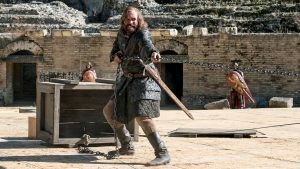 When they come back to King’s Landing for the final battle with Cersei for the Iron Throne, The Hound will be there and we will see ‘Clegane Bowl’. When it comes out that Jon is actually Aegon Targaryen how will the Northerners feel about that? Will they switch their allegiances to Sansa? I think so. How will Dany feel about that? Jon will be the true heir to the crown. He doesn’t care about that though so he may just say “You have it!” I don’t think they can be together though. Maybe Ser Jorah will finally win her heart after all.